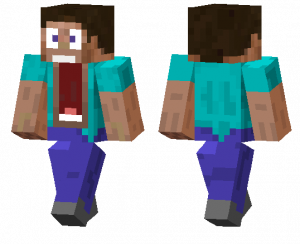 Guys, the new skin Scared Steve for mcpe 1.2.6, 1.2.7, 1.2.8 will add to the game very frightened Steve. So you just have not seen yourself yet. What happened? Perhaps the main character saw somewhere a Herobrin? Or is it just a legend and rumors that many current miners do not even know about ?! It’s hard to say what happened! But the author of this image was comprehended by the idea of ​​bringing into play a very terrified main character, so that he would frighten the others with his appearance. In particular, most of the mobs. The latter do not always pay attention to such trifles, their main goal is to kill as many positive characters as possible. But seeing the grimace on Steve’s face, most mobs will definitely change their usual plans. They themselves can be scared. Where to use the Scared Steve skin? To achieve a real sensation and surprise your friends, we suggest downloading the skin to a new card or testing it on your favorite multiplayer project. Show everyone who is around you who Steve is. This mouth is so wide open that something very bad seems to happen to him. But the author did it deliberately – that the facial expression was changed completely. MCPE Skin Scared Steve 1.2.6, 1.2.7, 1.2.8 is perfect for beginners, as well as for those who are already playing Minecraft PE for years. The author is creating this skin, strongly believes in the existence of the Hero, and therefore all the fans of this new skin says that the idea of ​​creating such an image was based on this legend. Like, Steve finally met with Notch!